The Beach House is a 4 story 750 sqm private house set into Mayungu Beach, The house lies midway between Malindi and Watamu, and occupies its own 10 acre estate. Its has 4 bedrooms, 3 are on the Ocean with their own private sun decks. The house is fully serviced with a Housekeeper/Cook, Driver/Houseboy, Gardener and Security Guard. They are ably supported by a pack of Watchdogs and a flock of Geese, Chickens and Ducks. Our Housekeeper has a range of recipes from Italian classics to English roasts, but a more accomplished chef can be arranged for longer term stays at extra cost. 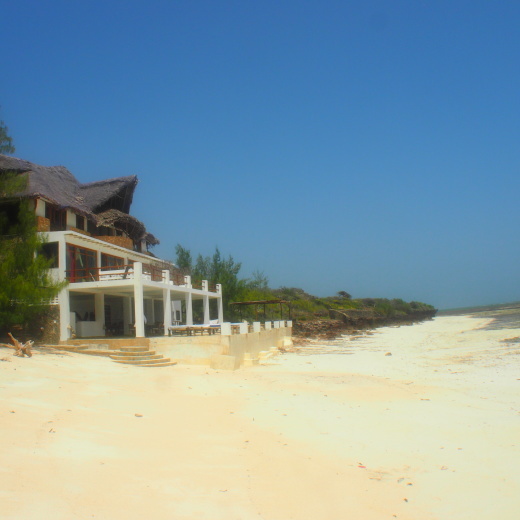 The house lies at the beginning of a white sand beach that runs to Watamu without serious interruption. Just off shore at low tide the famous Sardinia Due sandbanks grace the lagoon. It is the perfect romantic getaway and beachcombers paradise. Our kitchen garden produces vegetables and fruit which supply the house and can be supplemented by visiting Malindi, a 20 minute drive to the North, We can produce sandwiches and snacks on demand at a small supplement. The Beach House stocks a small honesty bar including a number of wines, mixers and spirits. You drink it and write it down, we count the bottle tops! Malindi is sometimes regarded as the Las Vegas of Kenya with its 2 Casino's and active night life. It boasts several excellent restaurants and comprehensive shopping facilities. It even has a Contemporary Art Fair every 2 years. Big game fishing, scuba diving and most of the toys are available by arrangement. We have access to 2 of East Africa's only motorised surfboards.... they come with their own engineer! Worth getting out of bed for once here? Our guests usually abandon their well made plans, raid the honesty bar and walk the beach until they forget about real life. The Beach House is a 4 story 750 sqm private house set into Mayungu Beach, The house lies midway between Malindi and Watamu, and occupies its own 10 acre estate. Its has 3 main bedrooms, all are on the Ocean with their own private sun decks. There is an extra bedroom in the Tower which is not en-suite. The House is available a a whole, with 4 bedrooms, by arrangement. Up to 12 adults can be accommodated comfortably by sleeping 4 adults to each suite. We can sleep in excess of 12, but this must be agreed prior to confirmation of your booking. Our Housekeeper has a range of recipes from Italian classics via Swahili classics to English roasts, but a more accomplished chef can be arranged for longer term stays at extra cost.